Have an app idea? Well, then you definitely have to prepare a checklist to hire the best iPhone application development service company. With so many mobile apps circulating in the tech-o-system, adding value to your app idea is essential and hiring the right team to make your idea come true plays a vital role here. References: Networking is important and getting the right information from the right source at an appropriate point does wonder. Choosing an app developer for your app becomes easier with a reference. If your source is a prime one and can vouch for the developer, it’s worth it. The reputation of the source matters the most and nobody passes references that can harm their very own reputation. References can also be chosen by tracking your competitor’s developer and their immediate substitute firm. It takes the development process to another level. Portfolio: You’ve met a developer- fair priced and planned. Well, all said and done, have you done a profile check? Having a fair idea of their previous work and asking for a portfolio viewing is quintessential and can help you zero-in on the right candidate firm. A developer team that has been able to deliver the perfect app – planned and designed as per the client’s requirement combined with their very own ideas definitely is the right choice for your app development story. The demand for the right team only increases with an increase in the investment behind the app. Your investment demands justice! App Reviews: Apart from just asking for a presentation or examining the portfolio, it’s also necessary for you to check the reviews on the apps developed by the potential team and the reputation they have earned over the years. 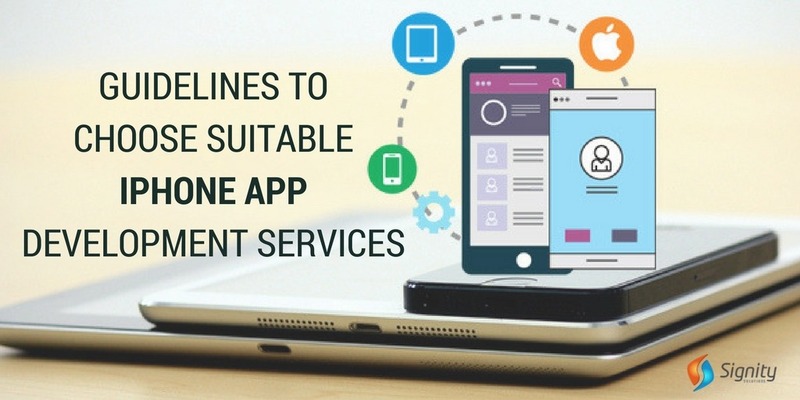 Most app developers try to hide their faux pas and checking on any such black marks on the list is inevitable, especially if your business is planning to develop the app into an expansion model or if the money involved involves higher stakes. 60 percent of the app must satiate the user experience checklist and developers that can perfect the UI/UX expectations work in your favor. A grapevine message can do the needful and it’s always good to find for more reasons to finalize the deal! Experienced team members: What is it that you want your app to accomplish? In about 99 percent of the cases, it’s a mélange of the app’s ability to hit the target, address the niche market, and enhance the current productivity while maintaining the competitive edge. In order to achieve this blend, a team with experienced players is vital and determining the experience of the core team members of iPhone app development services are crucial. The perfect blend of your ideas and experienced pair of hand at work can do wonders and that’s exactly where you shouldn’t compromise. Experience does not restrict its horizon to the number of years at work. A young member with an exposure that can encompass the criteria of years can also work to your advantage. Cost: Along with an app idea comes the question of the quantum of investment that will help make your ideas become a realistic one. With high expectations and an amazing team comes the cost of having them on board. Quality versus cost has been a turf without an optimal solution. Yet, it’s always advisable to prefer quality resources. With so many startups trying to make their mark in the industry, it’s worth undergoing an audit about the cost and quality parameters of the many options at hand. This will help you recruit a cost effective, quality focused firm. Outsourcing: Determining cost is crucial and picking a team that outsources their work to cost effective areas can help curb the fluctuating estimates. For examples, if the outsourcing is to places like India or Spain or Ukraine, chances are that the cost remains within the realm of your plans as compared to their expensive counterparts in North American and British expenses. Investigating a bit about the area of outsourcing can help you further in making the right choice. Ability to meet deadlines: You’ve planned the app launch and both you and the developers have created a timeline that can check the progress of the app. Will the team provide you with an app that meets your expectations within the predetermined timeframe? Is the team capable of delivering what they have promised? Many companies have faced issues with regard to iPhone app developers not being able to meet the deadlines. There may be many reasons to it. Firstly, the ideas may not have been understood the right way or the deadlines estimated by the developer or the company may not be specific and realistic. Make sure that the timeframe is scheduled practically and the developers to agree to it. In the case of a doubt, reach a consensus on the same and get going! Post-Deployment Support: Apart from creating a perfect app with a user-friendly UI/UX, other major functionalities and other testing parameters, the quality of post-deployment services offered by the team is also a crucial factor while determining the app development team. Keeping the app updated with the latest iOS features released by Apple and the app’s ability to remain compatible with every new device is important. Hence, emphasizing on this factor while preparing your checklist is imperative. With every iPhone app development firm, vouching for their abilities to get you the perfect app that can cater to all your needs, it’s advisable you perfect your checklist before diving into the deal. An app is a miniature gateway to your company’s reputation and philosophy. Getting it right in the first go in mandatory. A research conducted by our team suggests that about 40 to 45 percent apps have failed at helping companies establish the very reason for having invested in a mobile app. The loss at one may have to incur here is heavy and irreversible to a great extent. Developing an iPhone app is crucial and delicate. Make sure you hire the best for your iPhone Application Development Services providers! Have an idea? Planning to invest in an iPhone App? Or do you simply have something to share? Drop us a line at sales@signitysolutions.com. Our team of iOS, Android and other app experts at Signity Solutions would love to help you out or simply hear and discuss your ideas.